New Winter 2018: Is there a rocker on your list who would love this nicely detailed replica guitar ornament? The electrifying electric guitar personalized Christmas ornament features a bright red model adorned with glittering red notes, a strap and a banner that we will customize with the details you provide. 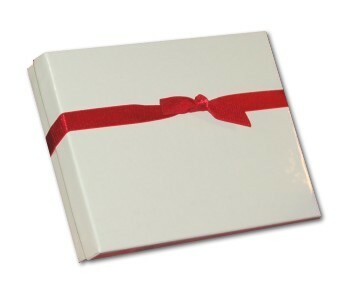 They'll be painted by hand in a cool font to create a memento perfect for the recipient. These electric guitar ornaments ship in our custom velvet gift bag and are ready to display virtually anywhere. 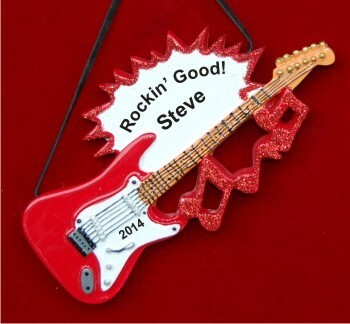 Cheer on the music this season with the red electric guitar personalized Christmas ornament from Russell Rhodes. Very Cool Nov 18, 2014 Ellyn D.